My friends, let’s accomplish a “two-fer” in this article and dispel two questions that Oregon fans (some that read this site too) have been articulating. The videos will be short and easy to watch, and the text is purposely going to be quick and to-the-point. Learning something new for discussion will never be easier than in this analysis! 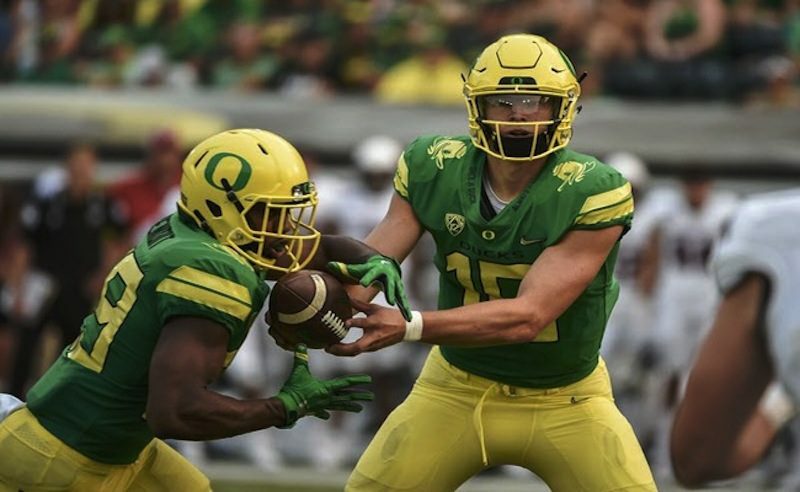 The first question is about how exciting it is for Oregon to begin running the Pistol formation under Coach Mario Cristobal and with the direction of Pistol Guru, Jim Mastro. The Pistol is not new to Oregon. As you can see in the video above, it was unveiled in 2014 against the Huskies and had a pretty good start! It was a superb surprise to pop on the puppies, and Duck ball carriers in post-game interviews were singing the praises of how the running back had more time to find the open hole. Above, we see that Royce Freeman needed no cuts to go all the way! Before you begin the video above … note the formation you see for a fraction of a second before the play begins—it is the Pistol. When was this play run? In the Civil War against Oregon State a few months ago! 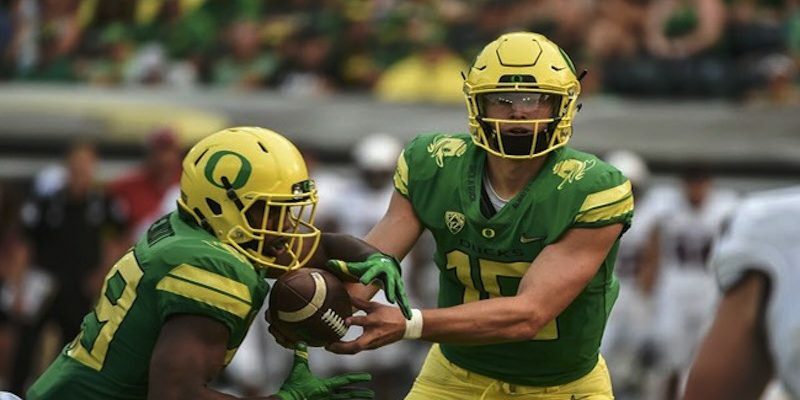 The Pistol formation was favored by Mark Helfrich and now Coach Cristobal, and the play above was featured in an analysis on FishDuck.com by Coach Eric Boles recently. In other words … the Pistol formation is not new to Oregon at all, though the surprised and delighted reactions are understandable, and I hope this helps answer some of the questions surrounding it. The second question is about how Oregon is “not running the quarterback” anymore and how my calls for changes to the QB runs were not calls for a complete non-running quarterback at Oregon. I see such generalizations from many corners, so now, using these videos, I will help all to see more clearly what I was stating. Above is a screenshot from the beginning of the “Toss Read,” a play covered here before a couple of times. It is one of the new plays that has swept the nation in the last couple of years. The QB decides to keep or pitch to the running back (dotted yellow line above), and in this play, you can see that Justin Herbert decides to keep the ball and follows the pulling lineman to the hole. This is not in open field (above), when the QB ventures into “linebacker land” where safeties can charge and immediately nail the ball carrier from the front while linebackers go for the legs and knees from the sides. This is not the only play designed this way (with the QB running between the tackles), but none of these plays appeared until the Taggart offense began last spring. The result was losing two quarterbacks within a few minutes of each other in the Cal game this last season. Above is a basic Inside Zone Read play, where the defensive end, who is being “read,” crashes down too far inside, and Herbert is able to pull the ball and run outside for an easy score. You watched Marcus Mariota, Bryan Bennett, Darron Thomas and Jeremiah Masoli do this often and rarely get hurt because the injury threat is diminished in this play (by not being inside the tackles). Above is an Inside Zone Read the other direction, and again, the defensive end crashes inside so Herbert pulls the ball. He is headed outside but sees the linebacker “scraping” outside, so Justin cuts inside. The “Scrape Exchange” is a typical defense the Ducks see, and they were ready for it with an offensive lineman blocking out, allowing Oregon’s QB to cut inside. Note that the QB ends up inside the tackles, but there is plenty of open space where Herbert can slide once he gets the first down. What is the difference between the two plays? Why is the Inside Zone Read filled with open space, while the Toss Read is not? The difference is the intended playside of the play—where is the play intended to go? With the Toss Read, it is evident where the play is going (the playside is to the left) and Herbert is headed into the teeth of the defense. The Inside Zone Read, the Outside Zone Read and Sweep Read plays have the intent of handing off to the running back to the playside. The defense sees the playside and moves over to cover the numbers, since the backside defensive end is being “read” and thus not blocked. The playside picks up an extra blocker since all blocking responsibilities shift to the playside, away from the unblocked defensive end. This extra blocker on the playside makes it crucial for the defense to compensate for the mismatch, which is why there is so much open space on the backside of the play (where the QB is running after he pulls the ball). The defense congregates on the other side, the playside! Again, the objective is to not run the quarterback, but if the backside defensive end leaves his lane open, an occasional QB run and slide into the backside of a defense will keep them honest. It also allows Oregon to have that extra blocker on the playside … which is what they want.